Cookbooks are available for $25. Macaroni salad is SUMMERTIME! This makes a huge bowl full. It is the combination of a few different recipes. One is from Aaron McCargo, Jr (Big Daddy) and the other is from Ree Drummond (The Pioneer Woman) and one is from my friend Melissa. I mixed them all together to make my own! 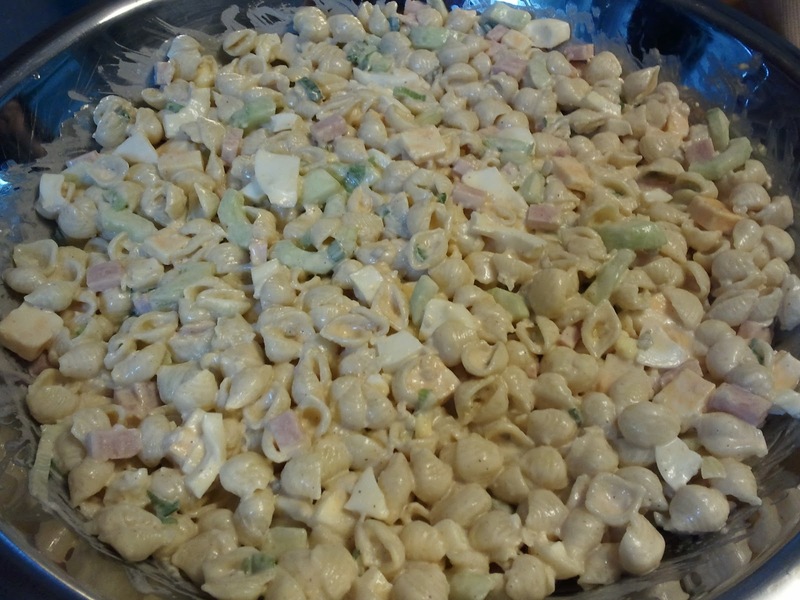 Many types of pasta can be used for this “pasta salad”. I used the small sea shells, but rotini or bow ties will work as well. Follow my link to find out how I boil eggs. Yes, there is a trick to it. Chez Helene is the name Donald uses for me when I am in the kitchen cooking. I am posting recipes that I like and that friends and family have asked me to share. I HAVE NOT created these recipes myself. I have created a cookbook of all of the recipes on this blog. If you are interested in purchasing one, please send me a message via email.